For my work as a graphic designer I often need exact colour specifications for printing or online publication. 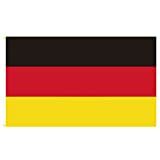 Yesterday a task led me to find out the exact colour codes for the German flag. I found surprisingly little about it on the Internet. In the past years, the colour specifications were always given differently by the Federal Government - sometimes in RAL, sometimes in Pantone. That still doesn't help us web designers and illustrators much. I have translated the individual colour spaces into each other and compiled them here. For the Pantone colours I chose the next one with minimal difference. I hope I was able to save some time for one or the other and help them.